Issuing bank is one of the core parties in a letter of credit transaction. Letter of credit is opened and finalized by the issuing bank. The issuing bank is the institution that gives ultimate irrevocable and conditional payment guarantee to the beneficiary. For example, an advising bank advises the letter of credit to the beneficiary as per the instructions that have been received from the issuing bank. An advising bank transmits the letter of credit to the beneficiary in the capacity of the advising bank. Similarly a confirming bank, nominated bank and reimbursement bank are all acting as per the issuing bank’s instructions and authorization. 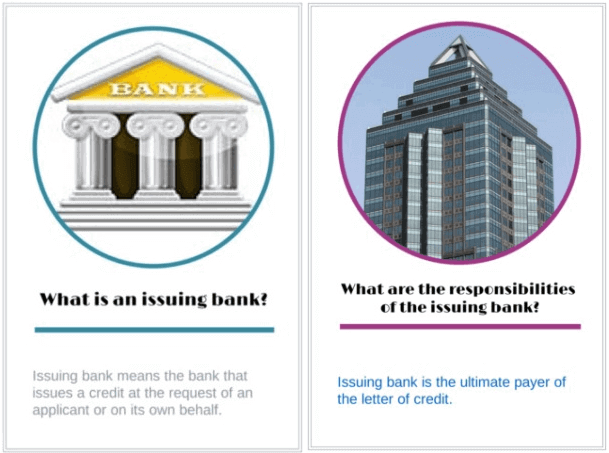 What are the responsibilities of the issuing bank? Which UCP 600 article regulates the issuing banks responsibilities? How does an issuing bank open a letter of credit? 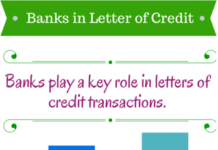 What are the main features of a well structured letter of credit? The issuing bank is the ultimate payer of the letter of credit. Even if other banks do not pay to the beneficiary against a complying presentation, the issuing bank must pay the letter of credit amount. This role of the issuing bank clearly defined under UCP 600. Let us have a look at the issuing bank’s payment liabilities under the letter of credit rules with different availability options. negotiation with a nominated bank and that nominated bank does not negotiate. The issuing bank’s responsibilities will be effective as soon as letter of credit issued. As a result an issuing bank is irrevocably bound to honor a complying presentation as of the time it issues the credit. The issuing bank must reimburse the nominated bank which honored or negotiated a complying presentation and forwarded the documents to the issuing bank. The reimbursement under the letter of credit available by acceptance or deferred payment is due at maturity, whether or not the nominated bank pays the credit amount to the beneficiary before the maturity date. An issuing bank’s undertaking to reimburse a nominated bank is independent of the issuing bank’s undertaking to the beneficiary. Which UCP 600 Articles Regulate the Issuing Bank’s Responsibilities? UCP 600 article 7 defines the roles and responsibilities of the issuing bank. The issuing bank’s liabilities have been described in article 9 under UCP 500, which was the previous set of rules for the international letters of credit. I have already covered the topic “How to open a letter of credit?” from the importers perspective. Today I would like to explain the letter of credit issuance process from the issuing bank’s point of view. Opening a letter of credit is a commercial decision. Banks issue letters of credit in order to make profit. An issuing bank charges letter of credit fees from the applicant against services it offers and risks it takes. 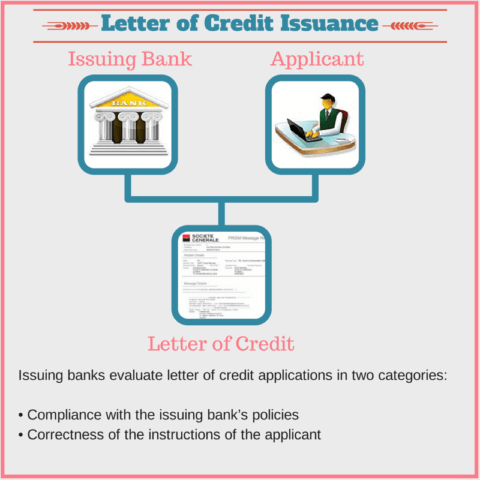 Letter of Credit Application’s Compliance with the Issuing Bank’s Policies: During the letter of credit issuance process, the issuing bank must ensure himself that he complies with national law and international regulations. As a result the letter of credit’s application compliance must be checked against the issuing bank’s letter of credit issuance policies. Is there any requirement of import licenses or import approvals? Is letter of credit application complying with the government requirements? Is letter of credit application complying with the central bank requirements? Is letter of credit application complying with anti money laundering regulations? Is letter of credit application complying with international sanction regulations? Is there any fraud risk in terms of applicant and the beneficiary of the letter of credit? Correctness of the instructions of the applicant: Documentary credit, when issued, carries the name of the issuing bank along with its reputation. As a result issuing banks must ensure that the letter of credit is defect free. In order to be make sure that the letter of credit does not contain errors the issuing bank must discuss with the applicant over the letter of credit structure. 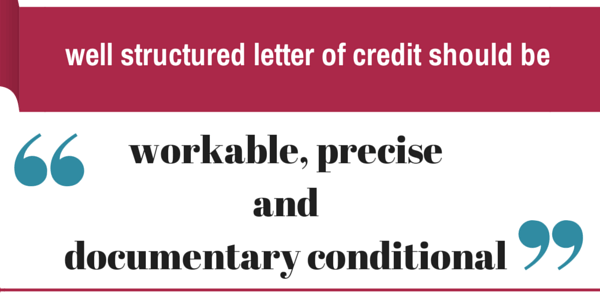 Work-ability of the Letter of Credit: The letter of credit must be workable for the beneficiary, which means that the beneficiary could make the presentation and get paid against complying documents without being dependent on any other factor. Example: Letter of credit should not contain a joker clause. Example: Letter of credit should not state a wrong incoterms. Example: Letter of credit should not contain a non-documentary condition. Clear Definitions, Plain Structure: A letter of credit should not contain ambiguous terms and abbreviations that may have different meanings. Additionally, a letter of credit must be precise. Issuing bank should discourage applicants to include excessive details in the letter of credit. Example: Virgules (i.e., slash marks “/”) may result in different meanings and should not be used as a substitute for a word. If, nevertheless, a virgule is used and no context is apparent, this will allow the use of one or more of the options. For example, a condition in a credit stating “Pink/Brown/Green” with no further clarification will mean only Pink or only Brown or only Green or any combination of them. 1. in case of sea transport, the transport document must indicate IMO ship number of carrying vessel. Example 3: 100 percent of commercial invoice value is payable at 30 days from applicant’s authorized representative’s signature on required documents. Example 4: One original bill of lading consigned to order and blank endorsed to be sent directly to the applicant. Courier receipt to be presented along with the shipping document. Example 5: Claim must be submitted to us not later than 14 calendar days after expiry date. Example 6: Negotiating bank must certify that documents were correct on first presentation. Example 7: Documents must be correct on first presentation. Correction of documents is not permitted. 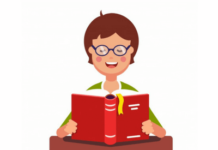 Example 8: Provided documents on first presentation are in strict conformity with the L/C terms, you are authorized to reimburse yourselves with the reimbursing bank. 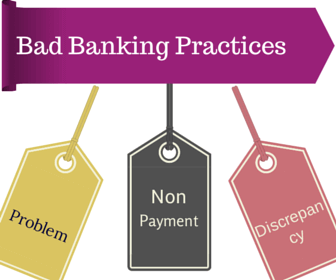 Clauses specified above represent bad practice, and issuing banks should refrain from including such terms and conditions in their credit. 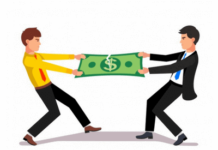 Previous articleWhat happens if court stops payment of an irrevocable, confirmed letter of credit?